I wish I had before pictures but basically my garage floor was completely covered. 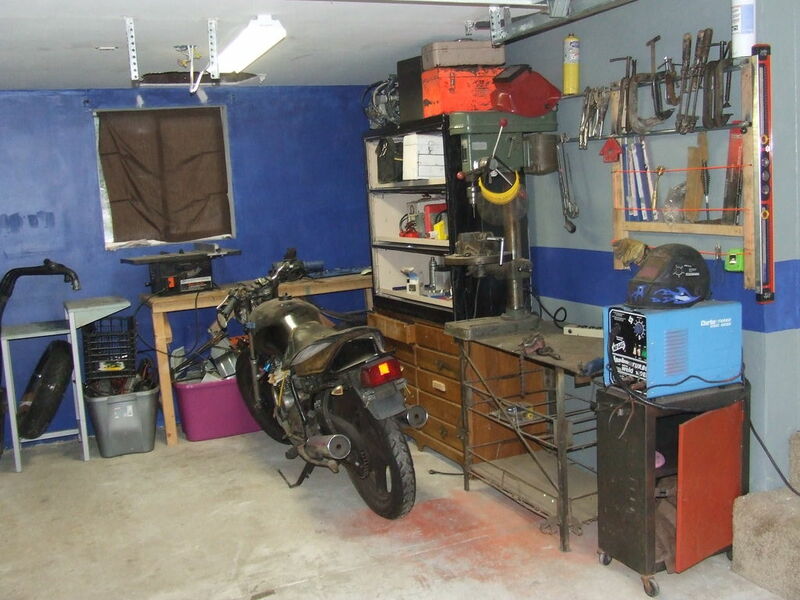 I would use 2 feet inside the garage and park the car outside and that would be my "organized" area. It took me 15 minutes to find a tool I just used yesterday. Here is hints and tips on how to organize your shop. The actual process and some of the organizational accessories. The way I love to do it is to start throwing things around. I usually go to Goodwill or the likes and get plastic tubs for about $2 a piece. you can also use boxes, but this can be frustrating when the bottom breaks and can't be used as easily again later. Your local grocery store has boxes they give for free if they have some. Decide what each box, bin, or Ziploc bag is going to be for. (or decide as you go.) start throwing all the misc. tools in a box. All the scrap metal in another, Cords and electronics in another, Welding supply, specialty tools, nuts & bolts & screws & nails, Epoxies, whatever you work with just organize it in some manner. Step 2: Let the Process Begin! Now take a box at a time and make a place for it. I started with all the Necessary tools I had. the box full of good and useful tools. I took everything out of all my toolboxes because there was no order to them. How often will they be used? Where will the be used? What is the easiest access? Necessary tools, so they'll be used very often. They need to be easily accessible so I wanted them to be hanging on a wall, I also wanted to be able to move them around because they would need to be used all over and hopefully rolled outside also. A cart. Carts are expensive. This is where it gets difficult, because I used a welder. I suggest you buy one. Harbor freight has them on sale for like $90. MIG Welder (Very easy to use 110V) don't let the sound of welder scare you. I then used 1/2" Conduit Piping from Home Depot $1.98 for 10 feet. (cheaper than 2X4's) It took about 4 ten foot poles to make this cart. I chopped off the top of the tool boxes and stuck them on. I measured the size I needed and started loading it up with most needed things hanging and less often used tools in the boxes. I had chip board 4X8 for $7. I drilled holes where I wanted the tools. Stuck in bent nails with wood glue to keep it in place. Next I needed all my sockets an ratchets to be very mobile possibly thrown into a car and taken to my brothers or laid on top an engine. Bought socket holders from harbor freight $0.99 a piece. Cut to size, holes drilled through metal and wood and zip tied down. Again welded metal rod to the side of the cart drilled holes in the wood and it slides on there and slides off. The next thing I knew I needed easy access to and the ability to move around was my air tools. So I pulled out the Air Tool Bin. I had heard of welding quickcoupler to a metal piece or a screwing it into a 2X4. I welded them onto the side of the cart going up and down. I can hold about 8 air tools, which really is all I need easy quick access to the rest can hang from the lower air compressor. Found the Quickcouplers on clearance at harborfreight $0.77 a piece you can get that deal on ebay often to. Make sure it's not the brass ones, I had one but I welded on a bolt and screwed it to the bolt. The cart is amazing and saves me loads of time. Even $200 - 300 carts don't hold all this so organized. I wish I had spent more money on bigger wheels, kinda of a cheap wad that way. I got some 3" wheel off an old movers dolly. Harbor freight again has some big wheels for $5 a piece and I wish I would have done that $20 for life long better mobility would have been nicer. Again just weld the wheel on. Next box was power tools and accessories. I wanted them easily accessible too. A lot of people seem to put them in drawers of files cabinents. Thats annoying. Before I found them a home I also knew I wanted to cut the power cords on all of them shrink them down to about 4in and solder the wires back together so they all have short stubby power cords, I hate having to wrap them and unwrap them. Then I made one 5ft extension cord from the thickest wire and soldered on a male and female plug to both sides. For the storing of the power tools I headed of to goodwill for an Idea to come to me. I found a towel hanger maybe or maybe a shoe rack? Whatever it was it worked perfect, holds my tools beautifully. On the side I keep the long extension cord I just grab tool and the extension cord and get to work. I still have to loosely wind up the extension cord but don't see that as big of a deal as wrapping and unwrapping it around the tool. For my welding supply I already had an amazing welding table my grandpa had made, but needed a place for all the clamps and welding supply. I was going to go with a pegboard, but decided it to be to much money for what simple thing I needed. It would have been $12 for the huge peg board, $6 for the 2X4 Backing and then all the little peg clips and some of the clamps are pretty heavy. Well you can see what I ended up making. screwed 2X4s to the studs hammered in larger nails to the 2X4 and welded the $1.98 for 10ft tubing to the larger nails. I then nailed in nails(?) to the 2X4 and ran string across them you could use heavier string if you have heavier stuff but 4 layers of the twine was quite strong. I did the twine across 2X4's again on the other side to hold my non welding clamps, pullers, tie downs, and other future stuff. Step 5: A Place for Everything. This is extremely straight forward. Make sure everything has a labeled place. I used to think of these places as store anything, but that makes a mess. the huge pull out file cabinet is really nice if you can find one. I found one at goodwill for $10 and a nice dresser for $15. $25 for a lot of storage space. I needed the Vise and bench grinder on something semi mobile. I had an old cart but it was really wobbly. Luckily I have a welder. I welded it at all the joints and that really stiffened it up. I drilled holes and bolted the vise and bench grinder down, but then realized I needed a little more table space every once and a while. As you can see it has a board that can go on top or hang on the side from the welded rod it can hang on. In a one car garage wasted space is not acceptable. Seemed like the welder was taking up space but right above it in the corner was completely empty. I made a little table. Used the same 2X4 and piping welded to nails method. threw a piece of chipboard that was left on top. You can see the long bench I also made from 2X4's and chip board. Strong, Cheap, and useful. When I get more stuff I'll put drawers on it. I slide the plastic tubs full of scrap metal underneath. Once you get the welder, start keeping anything metal that could be used later it comes in handy. Well I hope this helps give you some ideas about cheap organization, if you have something you have used or done let me know about it! Hope this helped. Great way to keep a large varity of tools accessable ...nice job ! A small space can be very efficient when you use it wisely. My tools and stuff are everywhere, this gets me thinking about making them a home so I am not wasting time looking for stuff all the time. Creative ideas, mine are woodworking tools not welding but same idea. Thanks for posting! I turned part of a room into a small shop out of necessity. It worked well. Nice instructable, but it's not easy to see pictures. Dude, this would be a lot easier to follow if you had taken a little care with the orientation of the pictures. yah sorry I just took pictures to show my garage and then decided to do an instructable on it. It isn't really meant to be a specific instructions on making something more like to give ideas of what I did and what you could do. If you have any specific questions I'd be glad to answer them.